Elliptical galaxies come in a range of shapes and sizes, from almost completely spherical to highly prolate (cigar-shaped) or oblate (pancake-shaped) ellipsoids. Unlike spiral galaxies, ellipticals are mainly composed of stars which are old and red, often having ages of around 10 billion years. Some ellipticals do contain younger blue stars, but only in small numbers, and not in the well defined arms seen in spiral galaxies. They also have only small amounts of cool gas and dust, and often appear rather featureless in optical images. Elliptical galaxies are thought to form through mergers of galaxies, with the merger process destroying any disc structure and randomising the orbits of the stars to produce the roughly spherical shape typical of these objects. Modelling suggests that ellipticals may undergo many mergers and interactions (of varying severity) over their lifetime, and some galaxies show signs of disturbance, probably caused by previous encounters. 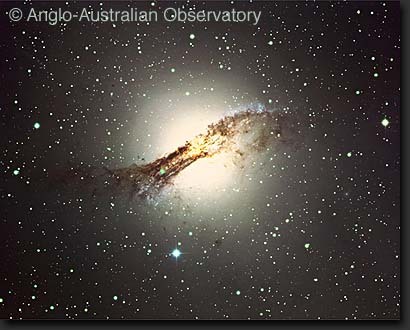 How do Elliptical Galaxies appear in X-rays? Elliptical galaxies contain several different types of X-ray sources. These include X-ray binaries and, in some galaxies, supermassive black holes. Ellipticals also often have large X-ray halos of high temperature (106-7 K) gas. These halos appear as extended diffuse emission within and surrounding the optical body of the galaxy, and can be as much as 300,000 light years in diameter. This halo often provides the bulk of the total X-ray luminosity of the galaxy, which is generally in the range from 1032 to a few times 1035 watts. Studying the X-ray binary population can help place constraints on theories of binary formation and evolution, and on models of the star formation history of the galaxy. Observations of the hot halo can provide information about the structure of the galaxy and in some cases have been used to estimate the amount of dark matter in and around ellipticals. IMAGE:- X-ray emission around NGC 3923. 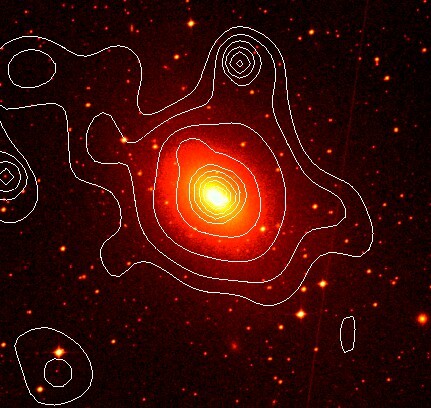 Contours of X-ray emission are shown in white superimposed on an optical image. The X-ray halo extends to very large radii, well beyond the stellar body of the galaxy. How does the halo form? The origin of the hot gas in the halo is as yet not well understood. The amount of gas usually observed is comparable to the cold gas content of a spiral galaxy, so it could be that during mergers cool gas is heated to X-ray temperatures. Alternatively, the halo might be built up from hot gas lost from stars through stellar winds and supernovae explosions. Ellipticals in groups and clusters might also be able to accrete hot gas from the surrounding environment. Further studies of ellipticals, for which XMM is ideally suited, are needed to resolve this issue.